On June 30, 1953, the first Chevrolet Corvettes started rolling off the assembly line in Flint, Michigan. Sixty years and scores of annihilated tires later, the 'Vette is still going strong, and an absurdly fast new 2014 Corvette Stingray is headed our way soon. 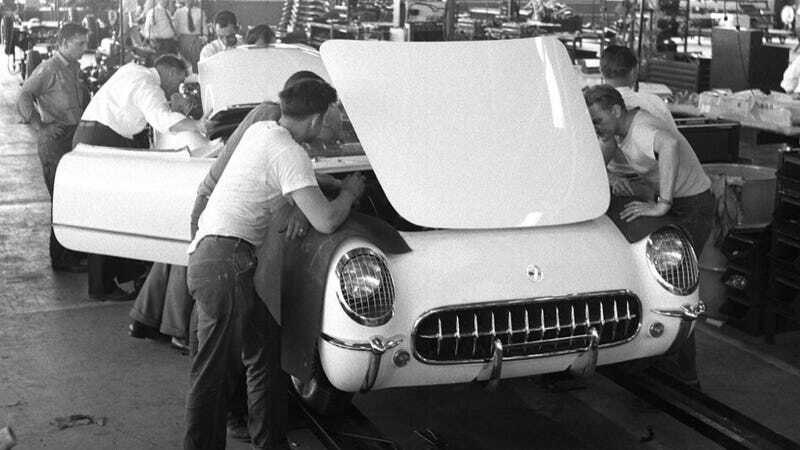 In celebration of the Corvette's 60th birthday this weekend, the folks at GM have put out a bunch of historical photos from the early 1950s when the car first entered production. The first Corvette is a very different animal than the one we have today. While it had an attractive design and resembled the sports cars of Europe, it came only with a two-speed automatic transmission and the anemic 150-horsepower "Blue Flame" straight six. Performance wasn't exactly Earth-shattering, and sales weren't either, but things improved in 1955 when Chevrolet decided to give the Corvette a boost in the most American way possible: by shoving a V8 under its hood. The rest, as they say, was history. Enjoy these photos of the original Corvette in all its glory, and be glad we've come a long way from the Blue Flame Six.